Over the weekend I was out at Tanaka Farms teaching the third and final of my Summer Cooking Series classes. (Don't worry, next up is the Fall Harvest Cooking Series!) It's kind of a weird time on the farm...I mean it's the end of Summer, so our Fall harvest is not quite ready for picking and the Spring harvest has long since gone. Ripe seasonal produce is mostly tomatoes, corn, and melons. And when I do these classes, I really like to focus on celebrating the season's bounty, so my recipes always center around what's in season. I chose to focus on watermelon. After all, there are a lot of folks heading to the farm for the Melon Tours and to get their hands on a sweet yellow watermelon. "Perfect!" I thought to myself. "But what am I going to cook with watermelon?" I mean I already did a kids class on Watermelon Agua Fresca a few weeks back and other than grilling it (which isn't much of a recipe) watermelon pretty much is a fruit that stands alone. Back in my Whole Foods Market days, a few of us creative types used to do some fun experimenting and I do remember using watermelon as a stand in for tuna to make a sashimi, and then I remembered seeing my friend Erin's post on her beautiful site Olives For Dinner where she made a Watermelon Poke Bowl inspired by a recipe in Bon Apetit Magazine. And I know Erin doesn't mess around when it comes to vegan-izing seafood. I mean she's a genius when it comes to that stuff! Inspired by Erin, and a host of other recipes from the old internet machine, I set out to create a very simple recipe for traditional Poke that would be easy to make and impress the very-much-not-vegan crowd at the farm. I am limited in cooking equipment out on the farm, so it had to be something I could pretty much make in one pan on a single portable gas burner. I am happy to report...this one really hit the mark! Not only was it simple to make, but the taste was spot on! Not exactly like tuna (I mean it IS watermelon, after all!) 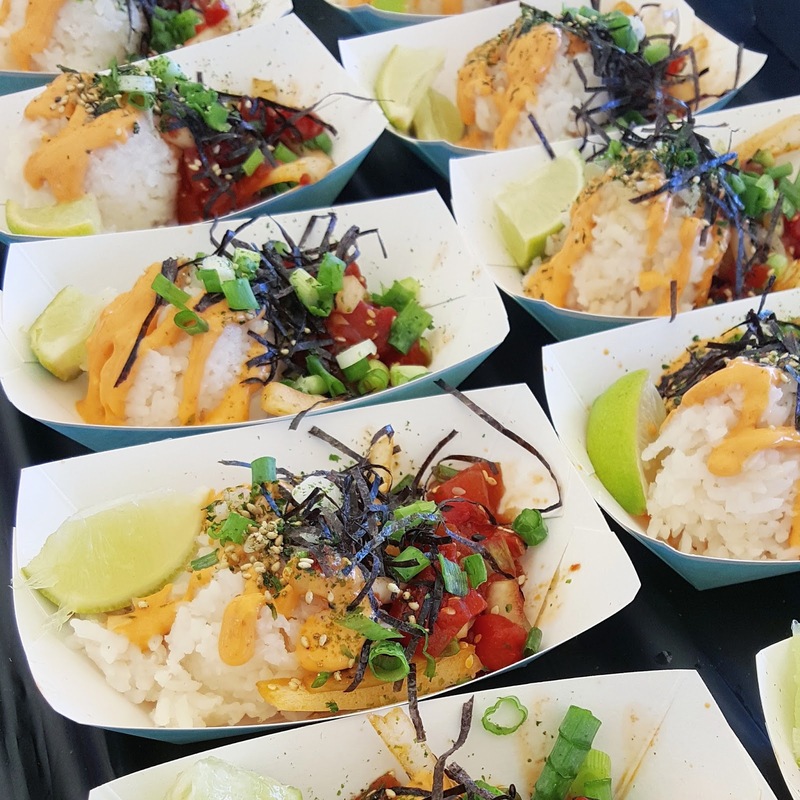 but according to all that gave it a try, it certainly was reminiscent of Poke, and had the right flavors and components found in a traditional Poke Bowl. Even Farmer Tanaka himself gave it the thumbs up. Okay, okay. Enough chit chat. On to the recipe! For a downloadable PDF of this recipe CLICK HERE. This recipe can definitely be made in parts and it can be made ahead of time so that all of the components are ready in the fridge when you are ready for some serious Poke Bowl action. This marinade will transform your watermelon from sweet to savory. 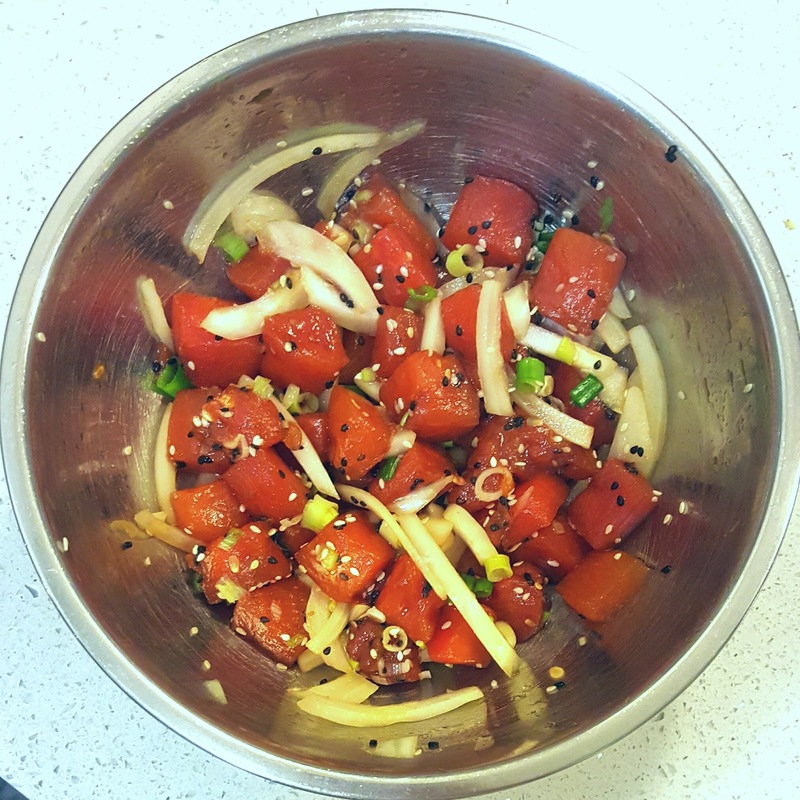 The vinegar will help soften the fruit and prepare it for cooking which will soften it even more making it the perfect substitute for ahi tuna in this vegan version of a Poke Bowl. Remove the lid and continue cooking for about 10 minutes more, or until deep red and translucent and most of the liquid has been absorbed. If you have a really juicy watermelon, you can drain off any excess liquid. Hawaiian Poke was made popular by fisherman who made this fish salad with the trim and scraps leftover after the prime cuts were used or sold to eat as a snack or appetizer. Add all ingredients to a bowl and toss to coat. until water has been absorbed. This sauce will quickly become a household favorite! I’m never without a squeezy bottle full in my refrigerator. Time to get artistic! All of your hard work will now be assembled into the most beautifully arranged bowl of Watermelon Poke. Start by adding desired amount of rice to the bottom of the bowl. Next add desired amount of Watermelon Poke. Top with a generous amount of Sesame Sriracha Sauce, Then Sprinkle with shredded Nori, Furikake, Sesame Seeds, and green onion. Samples passed out at the end of class. We ended up passing out about 150 samples between Saturday and Sunday's classes. Wow! 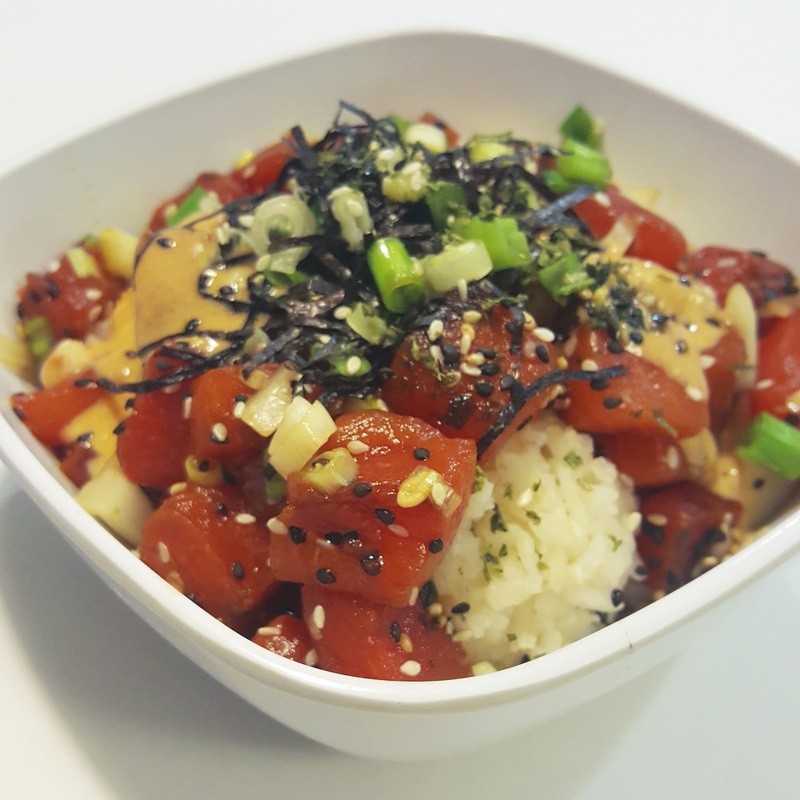 I've never had poke (never really ate seafood in my meat-eating days), but this sounds amazing! I love the idea of savory watermelon. It passed the test at Tanaka Farms, for sure! I was so nervous making watermelon poke for a big group of Japanese people who eat a lot of traditional poke. And they LOVED it!